If this post from nearly two years ago didn't convince you of my Uber-Geekiness, then this latest re-discovery certainly will clinch it. My Jewel Stone Rock Tumbler. Yep. I was A Lapidary. I was, in reality, A Lapidary Assistant. A Lapidary Protégé. A Lapidarian Apprentice. Even though my parents had given me the tumbler, Dad ensured the required recipes of grit type, water and proper periods of electrical power were adhered to. I helped pick out the stones. From then on everywhere I went, I travelled with my head down, searching for just the perfect specimens. After awhile, I got to know which type of raw rock would make the best polished gemstone. But the most important ingredient was patience. And luckily, my Dad has the patience of a Saint. He even kept the whole kit, stones and all for me. When unpacking it last night, not unlike Indiana Jones, I made an incredible discovery: one jar had remained sealed after all these years. Following numerous futile attempts at prying it open, I finally succeeded - to find it still had rocks inside! ... in erm, just a few decades. I wonder if one day you could be tumbling some rocks and find out that you had a hidden GEMSTONE!? My daughter still has hers after many many years, she brought it out again to try and make some jewelry from it. I will have to ask her how it went. 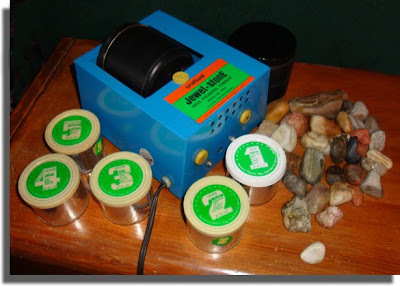 I need a rock tumbler like that for my green stones to get the prettiness out of them. I wonder where you buy those things now? I had one of those! My dad said it was the loudest Christmas present ever and so I didn't use it much. Ah, those were happy times. I've never seen one of those before. Very cool! I would not make a good assistant at all. I almost failed Geology in college. Now my husband, on the other hand, can identify all kinds of rocks in an instant. Your specimens are so pretty. What a fun discovery! I so wanted a gem tumbler, but never had one. I was a deprived child!! I always suspected you were a Lapidary. It's about time the truth came out. Janet: Why am I not surprised??? You and I discover more and more things we have in common every day it seems. Daisy: That would be AWESOME! Sistertex: I need to get mine going again. I have a lot of grit left; I just need the rocks and oil that machine! The Green Stone Woman: I couldn't find my model online anymore; not even on eBay; but there are local Lapidary groups here, so you may have some over there too who would help get you started. Beth: Ha! Which is why we ran the tumbler in my Dad's workroom in the basement. 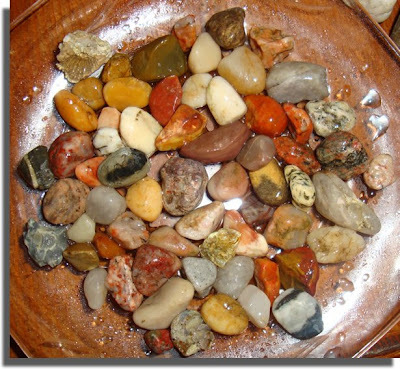 Kathy: Yes, it sure brought back a lot of memories; I remember I also had a jewelry kit to make necklaces and earrings from the smaller rocks we polished. Yes, VE I can believe that. 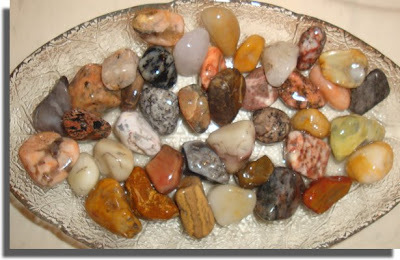 Babs: Yes, it was great to find interesting stones, and then discover how really beautiful they can be when polished up! Jay: Ha! Why not? I guess we are never too old for certain 'toys'. No way, those rocks look great! But wait a second, if they were very tightly sealed inside the jar how come they got all dirty? Well, I'll be darned if I didn't find that terribly interesting! Actually, my dad did a spot of this in my youth too. He was mad keen on it. We thought he was just mad. Still, whatever keeps you off the streets I suppose! By the way, Maureen, I received the Kreativ Blogger Award recently, and part of the conditions for this honour is to nominate other bloggers for said award who are doing wonderful, creative work on the World Wide Web. If it is okay by you, I would like to nominate you and your blog. I love the stories you tell and it's clear to me that you've led a more varied and interesting life than I! I'm envious! Thanks so much for the laughs and good cheer, Maureen. I've need it. :) Fanny: The stones have polishing grit on them! There used to be, many, many years ago, water in there too, but it would have evaporated over the years, leaving just the grit. It was like uncovering a buried treasure! Oh, Tony! How very sweet!!! You make ME jealous; your artistic talent is something I have always wanted to do -- draw comics! I am currently typing this in a hotel room in Fargo; today we are travelling to Minneapolis, so tonight I shall check out your links! Thank you so much for all your kind comments and award... you are very dear. NEATO!!!! I always wanted one of those but my parents said they didn't want to listen to the thing running day and night for the recommended period of rock polishing time. I bought one for my son when he was little, but either we were using it wrong or we got scammed. 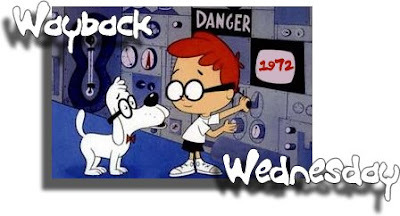 We let it run in our garage (because it's super annoying to listen to) for days and the only thing we got out of it was warm dirty rocks... and an inflated electric bill. Of course I think you're supposed to add water too or something every now and then, but I'm pretty sure we lost the instructions on the first day. But hey, still. Jo-Jo: I'll bet today's models are a lot quieter... at least I hope so. I have yet to actually test out my old one to see if it still works. Jeff: Ha! Yeah, I think you had to run it for weeks... adding oil to the machine daily. BTW, did you hear me say HI JEFF!!! as we passed St. Cloud yesterday??? Cause I yelled it from I-94... today daughter and I are off to the Mall of America. Again. 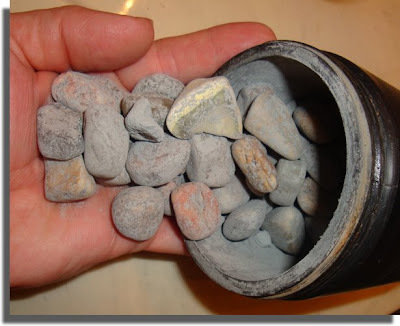 I LOVED my rock tumbler! I always got a thrill out of taking ordinary rocks and making them into something beautiful. And wow, those rocks came out awesome! Maybe I should have let mine sit for a few decades. Oh my gosh and those things take decades too- and the NOISE!!!!! They do come out pretty though. Vegas Princess: I wonder if I'll ever be that patient again to run it once more... probably not. Jill: You are right about the noise. Best to have an outside garage or shed to run it in... although you'll have the neighbors wondering what the heck you're up to.